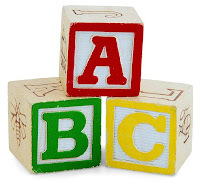 It’s so cute when a child learns how to sing the Alphabet Song in English. It’s even cuter when they can sing it in French. Then after they learn the letters, they can sing the ABC song in French! It’s very hard to write the phonetics for French words, but I thought it would be useful for some people to have a guide when teaching their kids the French alphabet. This is just my interpretation, not a text book version. I really love your blog. I visit it daily. Great job with the letter sounds. Wouldn't E make more of an "uh" sound? I am just learning French…I could be wrong. Thanks again for all your help and lovely ideas! No, I agree with you. I was trying to figure out a way to write out the e sound. I'll update the post. Thanks so much! I'm open to other transcription suggestions, so it will help us all be better teachers to our children. j = "ji" or maybe "zhi"
Exactly Sophie. It does depend on how we say them in our head. I'm from Texas, so my accent is very different than yours. I think that is why it's important to watch the video or another one and hear the sounds for ourselves. The sounds also depend on the region of France or Quebec. I thought about the sounds some more and I retranscribed (is that a word 😉 ) a lot of the phonetics. Hopefully it helps! ← Making Valentine’s Day cards and learning French!